MASCOT’s lightweight gilets are perfect as an extra layer of workwear during spring and summer, and they are usable for a number of purposes. The gilets can be used as an extra warm layer on top of a jumper or a jacket for the chilly mornings, but they can also be used on top of a T-shirt on warmer days. 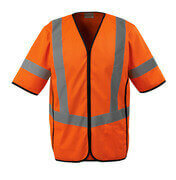 If you work indoors or in warm environments, the gilets are also particularly useful due to their low weight. The gilets are produced in lightweight materials, which makes them extremely comfortable to wear. MASCOT's lightweight gilets give you great freedom of movement so you can work unhindered while having your tools close at hand. Many of MASCOT's lightweight gilets are approved according to the UV Standard 801, which gives you a high level of protection against the rays of the sun. If you work e.g. within construction, as a gardener or a roadworker, where the work takes place primarily outdoors, it is important that the sunrays cannot penetrate your work clothes and damage your skin. Several of MASCOT's lightweight gilets are manufactured with triple-stitched seams, which give the gilets a high durability and consequently a longer service life. Choose between lightweight gilets with various practical pockets and other functional details that make them highly comfortable and usable for work. The gilets have both front pockets, inner pockets and chest pockets with integrated phone pocket. The gilets also have D-rings for keys or ID card. The lightweight gilets are available in various neutral colours so you can easily combine them with additional workwear from MASCOT. MASCOT offers logo print of e.g. company logo on several of the lightweight gilets.